Responding to arson terror and explosive kites and balloons, IAF fighter jets strike nine targets in northern Gaza. IAF fighter jets struck nine military targets in two military compounds and in a munition manufacturing site belonging to the Hamas terror organization in the northern Gaza Strip early Monday morning. 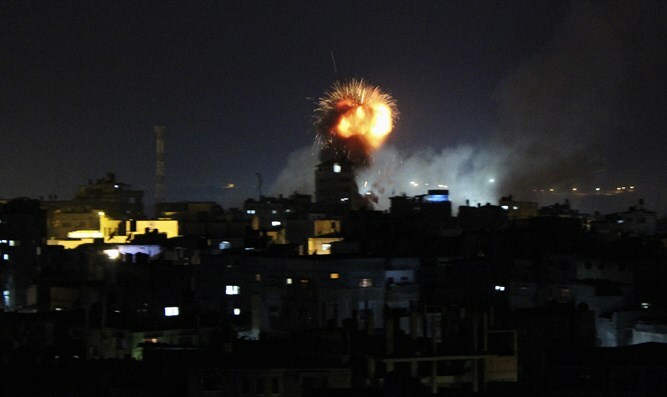 “The strikes were conducted in response to arson and explosive kites and balloons that have been launched into Israel. These are terrorist acts that endanger Israeli residents living in southern Israel and damage extensive areas in Israeli territory,” said the IDF Spokesperson’s Unit in a statement. “In recent days, the IDF has warned numerous times against these launches. The IDF fired warning shots near groups who were responsible for the arson and destruction in Israel, and has carried out attacks against infrastructure used by these groups,” the statement continued. “The Hamas terror organization is accountable for everything happening in and from the Gaza Strip, and it will bear the consequences,” concluded the IDF statement. Earlier, a series of “Red Alert” incoming rocket sirens were heard in the Hof Ashkelon Regional Council and in the Ashkelon industrial zone. The IDF later said that three launches were identified from the Gaza Strip aimed at Israeli territory. One of the launches apparently missed its mark and landed in the Gaza Strip. On Sunday afternoon, an IDF aircraft fired shots near a group of Palestinians who were launching arson balloons in southern Gaza. In addition, an IDF aircraft also targeted infrastructure from which the group had been operating, as well as a vehicle they had been using. Later on Sunday, two incendiary balloons launched from Gaza landed in an Israeli town near the border, damaging a home. Police sappers were dispatched to remove the devices.